Like small and mid-sized businesses across the country, Canadian government funding programs have missions, objectives, and strategies for how to maximize the return on investments. All government funding initiatives have a program focus/objective and several eligibility criteria that dictates the types of businesses that can access funding. In doing so, governments can ensure that the most deserving, forward-thinking businesses are able to receive funding and use it effectively. Businesses can use this information to their benefit. By using the funding program’s unique objectives and eligibility criteria, companies will learn how to present their business case in a more results-oriented way. The outcome, from Mentor Works’ experience, is a much higher success rate. When companies present their business project/ investment in the context of a funding program’s objectives, their chances of success increase dramatically. This blog will highlight three common project elements that Canadian government funding programs look for, including productivity, innovation, and exports. Businesses across the country are searching for ways to increase output while minimizing input. The pursuit of working smarter – to limit costs, increase production, or simply achieve greater efficiency – will help businesses to earn more money and maximize global opportunities. Small businesses from across Canada enhance productivity through product and process improvements. Purchasing new equipment, training your workforce, and mapping production processes enables greater productivity and helps businesses grow. Productivity increases help businesses to serve a greater amount of the domestic market, while also having additional goods that can be sold to new markets. Enhancing productivity almost always has positive repercussions on a business’ profitability, which is why the factor is almost always considered by government funding administrators. Innovation is a word often used in government funding that has several possible meanings, depending on where and how it’s used. As defined by the Organization for Economic Co-operation and Development (OECD), innovation is the implementation of a new or significantly improved product or process, a new marketing method, or a new business practice. Canadian businesses routinely innovate products and processes to gain new competitive advantages over their competition. This is often done by completing research and development (R&D) projects either internally or with industry/academic partners. By investing in innovative R&D projects, Canadian businesses can provide new solutions to their customers. In doing so, they become more sustainable and a more attractive investment for government business grants. Expanding into new or underdeveloped markets presents an immense opportunity for Canadian small and mid-sized businesses. Although domestic opportunities exist (and are often the easiest to satisfy), there are untapped potential customers all over the world that can be sold to. There are approximately 36 million people living in Canada, however the world population is believed to have risen past 7.4 billion! Engaging in projects that help businesses reach these untapped markets will encourage revenue growth. Participating in trade shows in foreign countries, developing marketing materials for new audiences, and conducting market feasibility studies can all help businesses achieve export market growth. The federal and provincial governments are stimulating business’ export growth by providing lucrative grants and loans for market development. In doing so, it’s expected that Canadian companies will be able to drive more revenue from international customers and bolster their financial strength. These principles are only a small portion of the knowledge Mentor Works maintains on Canadian government grants, loans, and tax incentives. As educators and industry leaders in government funding support services, we seek to inform Canadian businesses about growth opportunities currently available to them. 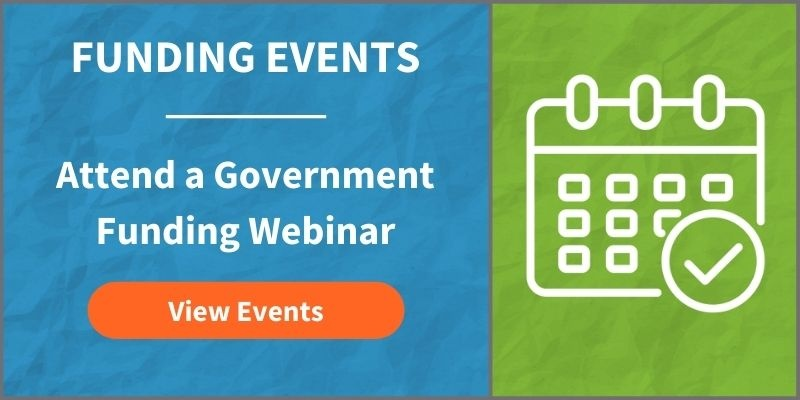 Business owners and executives who would like to know more about the government funding landscape should register for a themed business funding webinar, exploring topics such as export funding, hiring and training grants, and funding for research and development projects.